‘Old works of art are not…desirable only for their rarity or beauty, but for their associations, for the memories they evoke, the trains of thought to which they lead, and the many ways they stimulate the imagination and realise our ideals.’ – Ferdinand de Rothschild, Bric a Brac, 1897. It was in the Green Boudoir, in 1890, that Ferdinand presented Queen Victoria with an 18th-century fan set with diamonds as a memento of her visit to Waddesdon. A contemporary illustration in the Illustrated London News of 14th May 1890 shows the Queen planting a fir tree, dressed from head to foot in black. Widowed in 1861, Queen Victoria remained in mourning for the last four decades of her reign until her own death in 1901, and presided over an era in which attention to ritual, costume and accessories associated with death and commemoration assumed unprecedented importance at all levels of society. Although Waddesdon was celebrated in Baron Ferdinand’s day for the luxury of its house-parties and entertainments, at the heart of his own life may be discerned the shadow of the death of his stillborn child, and his wife Evelina, in childbirth, in 1866, just eighteen months after they married. This installation reflects upon Ferdinand’s words about the associations, memories and stimulus to the imagination that old objects may evoke, in relation to some of the remaining fragments of material associated with Rothschild deaths and the wider context of the cult of mourning during the 19th century. Offering a direct counterpoint to the dazzling virtuosity, rarity and connoisseur’s worth of the objects in the Waddesdon Bequest – Ferdinand’s legacy to the British Museum on his death in 1898 – the value of this more intimate material, which might instead be perceived to be “beyond all price”, lies in the associations it can evoke. 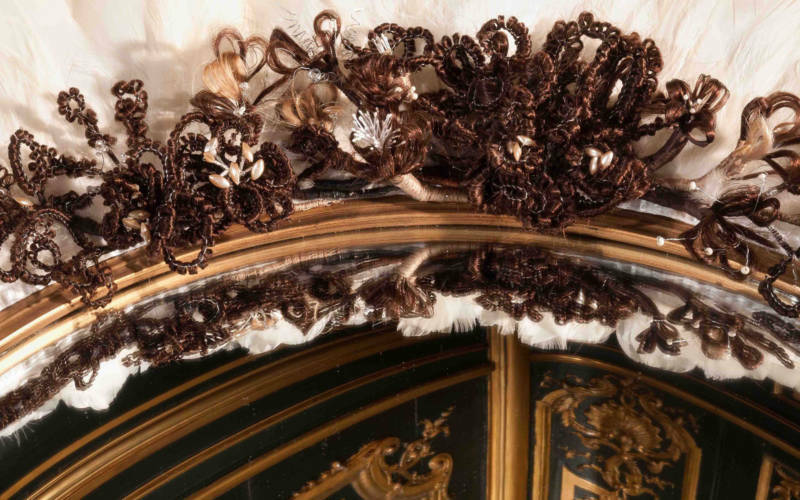 One of the most potent, and ubiquitously used, materials for commemoration during the late 19th century was human hair. 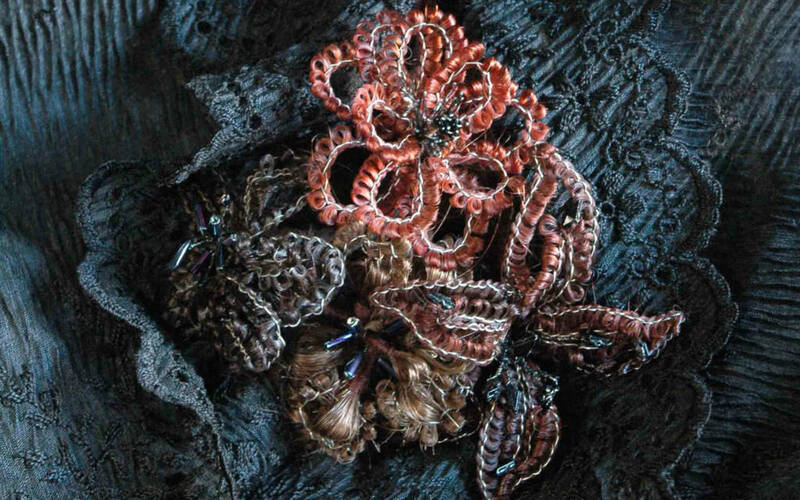 Traditionally collected and worn in jewellery throughout the 18th century – as either a love token, or for mourning – hair threads silently, though eloquently, in prodigious numbers of lockets, rings, brooches, bracelets, watch chains, and even elaborate wreaths of flowers, crafted by both professional and amateur hair-workers, during the late 19th century. 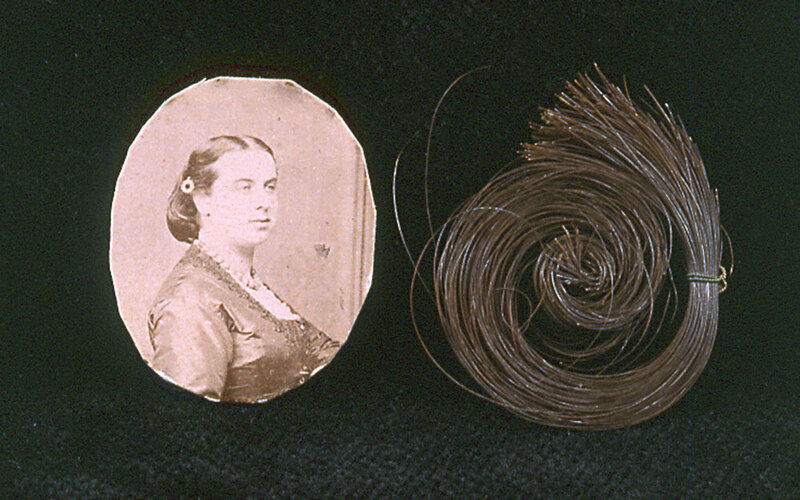 Centring on a small photograph of Evelina, cut as though to fit within a locket and accompanied by a small lock of her hair tied with cotton, archival material from Waddesdon, mourning jewellery from public and private collections in the UK, and print material are complemented by new works by Jane using hair as an enduring symbol of loss and mourning, memory and bequest.